Ameenah Gurib-Fakim has been the Managing Director of the Centre International de Développement Pharmaceutique (CIDP) Research and Innovation and Professor of Organic Chemistry with an endowed chair at the University of Mauritius. She was elected Chairperson of the International Council for Scientific Union – Regional Office for Africa, for the period (2011-2014). Since 2001, she has served successively as Dean of the Faculty of Science and Pro Vice Chancellor (2004-2010). She has also worked at the Mauritius Research Council as Manager for Research (1995-1997). Ms Gurib-Fakim earned a BSc in Chemistry from the University of Surrey, UK (1983), and a PhD from the University of Exeter (1987), at which time she began working at the University of Mauritius. Between 1987 and 1992 she served as Project Leader for the first Regional Research Project on the Inventory and Study of Medicinal and Aromatic Plants of the Indian Ocean funded by the European Development Fund under the aegis of the Indian Ocean Commission. During 2000-2002, she served as the National Coordinator for the ‘Indian Ocean University’ funded by the European Union. She has participated in several consultation meetings on environmental issues organized by the World Bank and was the Lead Coordinating Author on the International Assessment of Agricultural Knowledge, Science and Technology for Development (IAASTD) spearheaded by the World Bank. She also served as an Independent Director on the Board of Barclays Bank of Mauritius Ltd.
As a Founding Member of the Pan African Association of African Medicinal Plants, she co-authored the first ever African Herbal Pharmacopoeia funded by the Centre for the Development of Enterprise (CDE) and ProInvest (ACP), Brussels. She is Member of the Reference Group of the International Science Programme (IPICS) of Uppsala University, Sweden, and serves as Scientific Advisor to the International Foundation of Science (IFS), Stockholm. She has also served as Member of the Expert Panel on “Infectious Diseases” of the Special Programme convened by the UNDP, UNICEF, WHO and the World Bank. She furthermore, serves as a Member of the Scientific Advisory Council of Ntembi and Nuclear Energy Commission of South Africa (NECSA); Member of the International Advisory Committee for the Cyclotron Project of the Indian Ocean based in Reunion (France) and the International Representative on the Assessment Panel of the Canadian AUCC-CIDA projects. Ms Gurib-Fakim has authored and/or co-edited 28 books and several book chapters. Within the field of biodiversity conservation and sustainable development, she has authored scientific articles and has lectured extensively across the world. She is a Member of the Editorial Boards of major journals, has served on Technical Committees in various capacities, including the Chair of several National Committees in Mauritius. Ms Gurib-Fakim has been elected Fellow of the Linnaen Society of London in 2007, Fellow of the Islamic Academy of Science, Jordan, in 2009, and Fellow of the African Science Institute in 2010 and the African Academy of Sciences where she is now Member of the Governing Council. Ms Gurib-Fakim received the 2007 l’Oreal-UNESCO Prize for Women in Science and Laureate of the National Economic and Social Council. She is recipient of the special prize from the CTA/NEPAD/AGRA/RUFORUM and the African Union Commission Award for Women in Science, both in 2009. 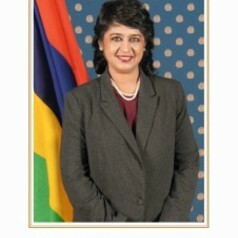 Dr (Mrs) Gurib-Fakim, was elevated to the Order of the Commander of the Star and Key by the Government of Mauritius in 2008, and admitted to the Order of the Order of the Chevalier dans L’Ordre des Palmes Academiques by the Government of France in 2010, and received her DSc from the Université Pierre et Marie Curie (Sorbonne Université), Paris, France in 2013. In 2014, Dr (Mrs) Gurib-Fakim became the first Mauritian to address the prestigious TEDGlobal Conference in Rio de Janeiro. On 05 June 2015, Dr (Mrs) Gurib-Fakim was sworn in as the 6th President and the First Female President of the Republic of Mauritius.